The first-ever state corruption risk investigation performed by the Center for Public Integrity has been released, and the findings are depressing. 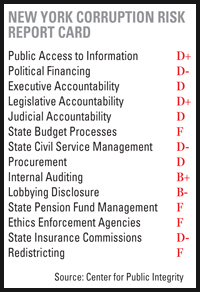 After examining state government anticorruption programs and policies, and accountability and transparency standards utilizing 330 integrity indicators, the center concluded that not a single state deserved an A grade. Five states were awarded a B, 19 a C, 18 a D and eight states received an F.
The primary reason for the poor grades: Ethic laws, disclosure procedures, open records and enforcement policies lack the bite needed to effectively combat the culture of corruption that has infested the inner sanctums of many state governments. The most surprising grade was New Jersey’s B+. Jersey, which has been the mecca of corruption, investigations and indictments, did well because in recent years it has enacted “some of the toughest anticorruption laws in the nation.” It boasts a transparent pension fund, a powerful and aggressive ethics enforcement agency, detailed financial disclosure requirements for the governor and other state officials, and genuine anti-pay-to-play laws fo r contractors. Sadly, New York came in 36th place with an overall grade of D.
This poor grade should not be a surprise to New York taxpayers who have watched the membership of Albany’s Gallery of Rogues grow by leaps and bounds in recent years. Seventeen state legislators have left office to confront corruption charges or to check into prisons during the last 11 years. The latest gallery nominee, former state Sen. Pedro Espada Jr., is on trial in federal court answering charges of six counts of embezzlement and theft totaling millions of dollars. If convicted, he will become New York’s poster boy for corruption. One count of the indictment accuses Espada of stealing more than $200,000 from Soundview, a government-supported charity, between 2005 and 2009. This indictment alleges that the money was used to pay for lavish dinners, Broadway show tickets and a down payment on a Bentley. He’s even accused of pressuring a videographer, who filmed his grandson’s birthday party, to bill the Community Expansion Development Corp., a cleaning company controlled by Espada, and to call the party a “Children’s Community Outreach” event. While Albany’s wrongdoings get most of the media attention, New York’s local municipal employees and officials are not immune from criminality. Just this past week a former assistant commissioner in New York City’s Department of Housing Preservation and Development pleaded guilty to accepting $600,000 in bribes and kickbacks. A University of Illinois Institute of Government Affairs report, released in February, named New York the most corrupt state in the nation. Department of Justice public corruption convictions compiled by the Institute revealed that between 1976 and 2010, 2,522 public employees were found guilty of crimes. Runners-up were California and Illinois, which had 2,345 and 1,828 convictions, respectively. Until New York creates a truly independent public ethics commission and really tough and transparent disclosure, accountability and campaign finance laws, all of which keep political foxes out of Albany’s henhouse, expect the state to continue receiving poor and failing grades on the Corruption Risk Report Card. This entry was posted on April 8, 2012 at 10:00 am and is filed under Articles/Essays/Op-Ed. You can subscribe via RSS 2.0 feed to this post's comments. You can skip to the end and leave a response. Pinging is currently not allowed.